The Newton Thong is a recent addition to the Kiniki line. The narrow sides drew me into it along with the back design being a bit different than others I have with string sides. Looking at it from the front you’d probably think it is a g-string. Turn it around and you see that it is really a more traditional thong back. Kiniki has offered some similar styles like Miles and Tonga (no longer available). The backs of both of these don’t flare out at the waistband as much as this Newton one. They had string sides, but the Newton is narrower and not as a heavy duty looking waistband. With the narrow 3/8″ sides comes the concern of staying up. That issue is addressed with less max stretch of the waistband. These are a tighter fit getting past the hips and rear than with other Kiniki pairs. Now it’s not so tight that it is hard to get on. It just takes a little front to back wiggling of the sides instead of pulling the pair up from the middle of the sides. Initially I thought this thong could benefit by a tad more length front to back. But after several wears I feel there is a break in period period for them. Or maybe I just have the adjustment right when pulling them on. They have become more comfortable with each wear, so I’m saying they needed broken in. These are noticeable you are wearing a thong. I do find it a comfortable knowing now. I did have to adjust at time the first couple wears. For me the are more noticeable with my sitting posture over standing. The tail is about 1” wide, but flares out to about 5 ½” by the time it is attached to the waistband. Now the pouch of these offer good support. It is contoured with a center seam for the boys. Probably put it at moderate coverage and has a decent amount of room in the pouch. 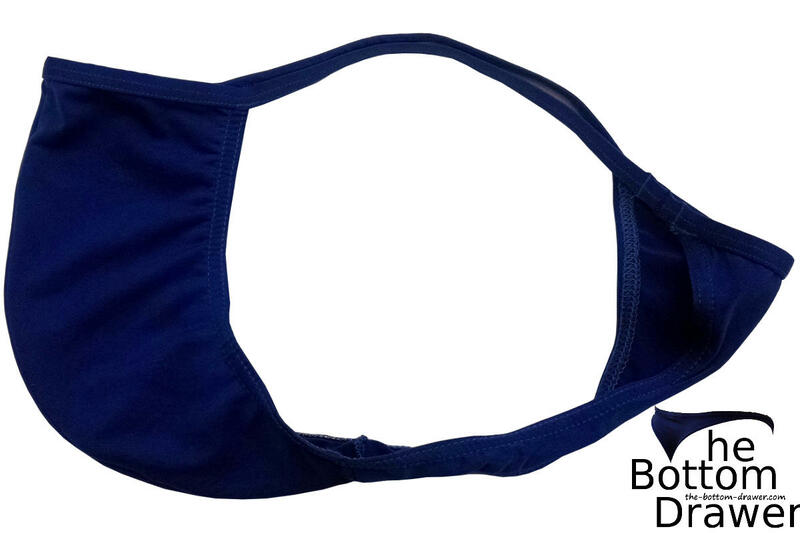 The Newton thong is made of 92% microfiber and 8% lycra. It says to warm hand wash, rinse thoroughly, and do not tumble dry. I’ve been putting them in the washer and hang them to dry. No issues with that method so far, but for longevity it is probably best to follow care instructions. A couple picky things about the thong is first the tag placement. It’s sewn into the side of the pouch. On the plus side I don’t find it scratchy and can always cut it out. Just have to make sure it isn’t sticking out the side of the pouch. The other thing is how the waistband is sewn together or at least the location of it. They have it coming together with both ends looped and then sewn together at the point the tail connects to the waistband. I’d prefer it center of the back of the pair. Overall I like the cut of the thong. I like the traditional back look with the string sides. If I was placing an order with Kiniki’s, it is one I’d add to the order in another color. I wouldn’t just decide to place an order to get this particular thong. For the comfort of the thong I kind of split the initial few times with what I’m calling a break in period. As I mention it has gotten more comfortable over time. What do you rate the Kiniki Newton Thong? Was somewhat surprised to receive a new catalogue from Kiniki last week. Apparently it’s their first one in two years. Thought you might be interested to know(if you don’t already),that there is 50% off everything including the Newton styles that you have recently reviewed. Don’t think I will be tempted to buy anything after the disappointment of the Allure g-strings that I bought last time. Thanks, most of their stuff seems to be typically 50% off their list price. Sale this weekend was 65% off. I haven’t seen a catalog from them in a while. Think the ones I got usually came with my orders. I was not crazy about the Newton thongs I have purchased from Kinik;, too much material in the back to be classified as a thong and the cut is not as good as their regular bikinis. Well made but just ‘blah’ for me. Thanks for sharing your experience with the Newton thong. The more view points the better for people to make an informed decision. Don’t forget you can rate it with the stars too.